L 8 1/2″ (22 cm). Grating “veer.” Song is without musical quality, interspersed with whistles and mimicked notes. Description: Sexes similar. Chunky; with short, square tail. 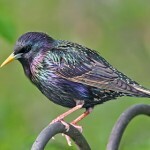 Breeding plumage is black with iridescent green-purple gloss, and a yellow bill. Winter plumage is duller; heavily speckled with light spots; dark bill. Distinguished in flight by square tail, stocky body, and short, broad-based pointed wings that appear pale gray from below. Juveniles are unspotted; grayish-brown above; and paler below. Habitat: Found almost everywhere throughout the year. Especially associated with human habitations such as cities, suburbs, farms, and with mature woodlands having woodpecker holes or other tree cavities for nest sites. Where in Nebraska: Common to abundant permanent resident across the state. Migrants from the north increase the fall and winter populations. Field Notes: European Starlings often compete with native species for nest holes. 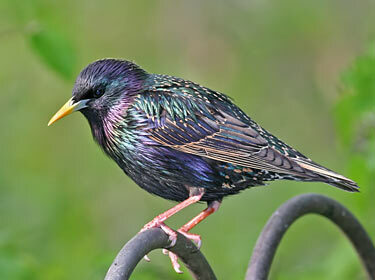 Fun Facts: European Starlings numbering 200 millions from Alaska to Mexico are considered pests and are not native. They all descend from 100 individuals that were released in New York’s Central Park in the 1890s by a group that wanted to establish every bird that William Shakespeare ever mentioned.